I love, love, love how these turned out. We took our annual family group costume photo this past weekend. 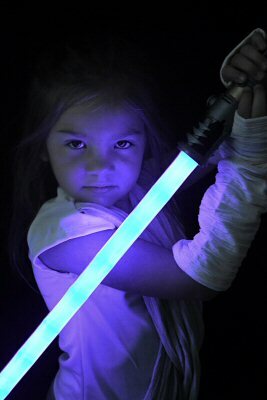 As a treat, we let the girls run around with their light sabors at dusk, so they could see them all light up. Of course I followed the girls around with my camera because, why not? Since it was only dusk the glow wasn’t very pronounced in the pictures in the pictures. 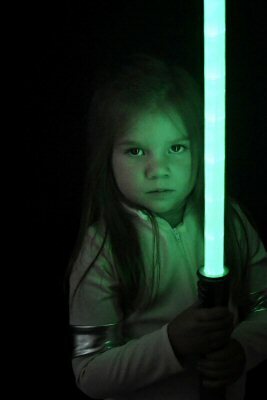 Nicole was disappointed her blue light saber wasn’t showing up as nicely as Alexis’ green saber. She wanted to take more photos (in her own words “a thousand photos”) were you could really see the saber too. An idea was born. The initial plan was just photograph Nicole and Alexis in costume with their blue and green sabers. 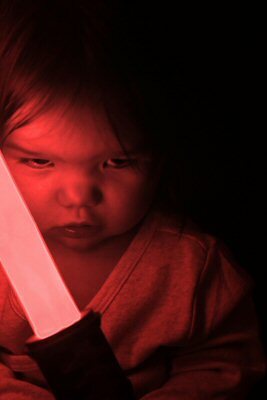 I hadn’t gotten a light saber for Dana, what with her being nine months old and all. The more I thought about it, the more I wanted a matching photo of her with a sabor as well. I wasn’t too enamored with her with Yoda custom (either the original or the one I hobbled together). She kind of looked like a green lamb in her headpiece. Having a “Jedi Dana” photo seemed like a good way to make up for that fact, and to ease the pain of way over spending on our costumes. Domingo thought she looked at bit like Anakin Skywalker in her tunic and pants. We had a Kylo Ren sword (free conference swag) and so “Darth Dana” was born. Only problem was the free light saber was terrible. It had just two LEDs in the base of the sword where Nicole and Alexis’ had at least nine running down the length of it. Those two puny LEDs did not cast enough light for the camera to focus well, or to illuminate her face. Having already spend a ridiculous amount on costumes this year, buying another saber was the last thing I wanted to do. I needed to improvise. I shot Dana with the blue light saber and changed the hue in my poor man’s photoshop. As for the pose, I just got lucky. She was looking down at a toy in her hands and I happened to snap the photo as she was raising her gaze to look at me. The framing isn’t perfect, but it’s one of those moments you can never manufacture. Technical details: the kids are standing in front of a black backdrop which is probably not needed, but doesn’t hurt. I used full manual mode: small shutter (~F/7.1) and fast shutter (1/200s or faster) to reduce any chance of blur. The raw photos are very dark, so when I bumped up the histogram they’re a touch grainy. Personally I think it adds to the look.